Those common readers of our blog know we spend a lot of time playing new courses at locales of travel with the hope of finding a few diamonds in the rough to share with you. While our main goal is to give golfers in our own locales some information about the many local courses in our respective areas, we also like to share our experiences on various travel excursions. One spot that both LG and I have frequented for golf vacations (and vacations in general) is Las Vegas. Although not ideal from a price point, Las Vegas is a great place to play golf. There are numerous options that give the golfers of the city a chance to get out and see what desert golf (or some variant thereof) is all about. LG and I have reviewed several of these courses (and played several more). And while they all have their own character, they seem to bring different features to the party that is a Vegas vacation. On my most recent trip, I had a choice between playing Paiute in the afternoon in August or playing Bali Hai in the morning. Given that the temperature was around 110 degrees in the afternoon, I chose to play Bali Hai in the morning. Bali Hai is one of the iconic courses in Vegas if for no other reason than it is right on Las Vegas Boulevard (aka, “The Strip”). Although other courses are close (i.e., the course at the Wynn), I don’t know of any other courses that are actually addressed on the strip. As such, Bali Hai is a course that gets a lot of play year round if for no reason other than it is convenient to most major resort hotels in Las Vegas. Having heard about this course for years (heck, maybe even decades), I decided it was finally time to play it. Bali Hai is a south-pacific themed course with white sands, exotic flowers, palm trees, rock outcroppings, and various homages to south-pacific architecture and style. The course plays (in my opinion) very short at 7,000 yards, likely because of many elevated tee boxes and thin desert air. For example, my second shots into the four par 5 holes were made with 9-iron (531-yard 2nd), 7-iron (550-yard 7th), 8-iron (518-yard 10th), and 7-iron (550-yard 15th). Even with some long par 4s (482-yard 8th, 484-yard 17th, 486-yard 18th), I had no more than a 7-iron into any green. While the course does have a few tricky drives, there are a lot of opportunities to use the driver (something I don’t see a lot in Atlanta), and there is usually an open side if one side has a hazard or OB. What this course has going for it is convenience. The price isn’t great (I was getting a deal at $125–the rack rate is over $200), but it’s not as egregious as some other places. For example, the Wynn course is over $500 to play. However, if you’re a person who values proximity, Bali Hai is a great value. For me, I had to play a round of golf in the amount of time my wife was at the spa, so the locale of Bali Hai was worth it for me on this trip. The photos below, showing great views from the 14th and 18th tee boxes, illustrate how close the course is to the Mandalay Bay, with the Luxor seen between the two towers of Mandalay Bay. As far as Vegas goes, the course is OK. If this course were plopped down in an Atlanta suburb, it would see a ton of play and be voted amongst the best in the city. But in Vegas, it’s so-so. What I liked about the layout was that it had some elevation change. I’ve played a number of courses in Vegas that were so flat you could land a plane on them. Bali Hai has some elevated tees, some uphill shots to greens, etc. It also has good use of water features, with a few creeks, a few greens well-guarded, and a few interesting water hazards with sand leading down into the water. The staff was friendly and helpful, and I appreciated their attention to detail, helping me in the process from the time I drove up to the moment I left. The course is well-watered, as they understand that the players need to be hydrated to have a good time (something very important in Vegas). What I didn’t like about this course was the condition. I have to be fair–most courses in the area are pretty bad at the end of August, and Bali Hai (like many others) was about to close for overseeding. That said, the greens are bermuda, which is an immediate strike for me. They were running only 9 on the stimp and had a lot of burnt spots. The bunkers were inconsistent, some as hard as concrete under a thin layer of sand, some like Daytona Beach. The fairways and rough were recently cut, and apparently this world-renowned course does not have a bagging mower, because there were piles of bermuda leaflets everywhere. Also, another seasonal issue, the greens were hard as concrete. I hit two 7-irons into good spots on par 5s and ended up with the ball bouncing over the greens and into depressions that were difficult to chip from. Further, the range was an oddity. It has a very cool automatically loading tee that allows the player to hit ball after ball without bending down to re-tee. However, the range faces the strip and is no more than 100 yards long. As such, it is entirely enclosed in netting, and your drives are essentially limited to the first 100 yards of travel. I hope you don’t have any late movement the day you play. Oh, and, speaking of landing planes, the course is RIGHT next to Las Vegas McCarron airport. Being that it’s so close, you can expect to be buzzed multiple times by jumbo-jets bringing in starry-eyed vacationers and transporting drunken/hungover and broke folks out. It actually wasn’t as loud as I expected it to be, but it was distracting for sure. Altogether, I think the course was nice and certainly suited my needs for the trip. However, I would probably prefer to play Paiute or Rio Secco next time I make it out, as I’ve heard great reviews on both. Overall: 7/10. Good to say I’ve played it, but won’t be back until I’ve played a few others or if I need to play quickly. This review is long overdue. It is overdue not only because LG and I played it a few months before starting this blog–and it would’ve been a tremendous subject at that time–but also it is overdue because LG and I both feel that this is one of the top courses we’ve ever played. In April of 2010, LG and I traveled to Las Vegas for a golf & gambling week to celebrate our nearing graduation from law school. 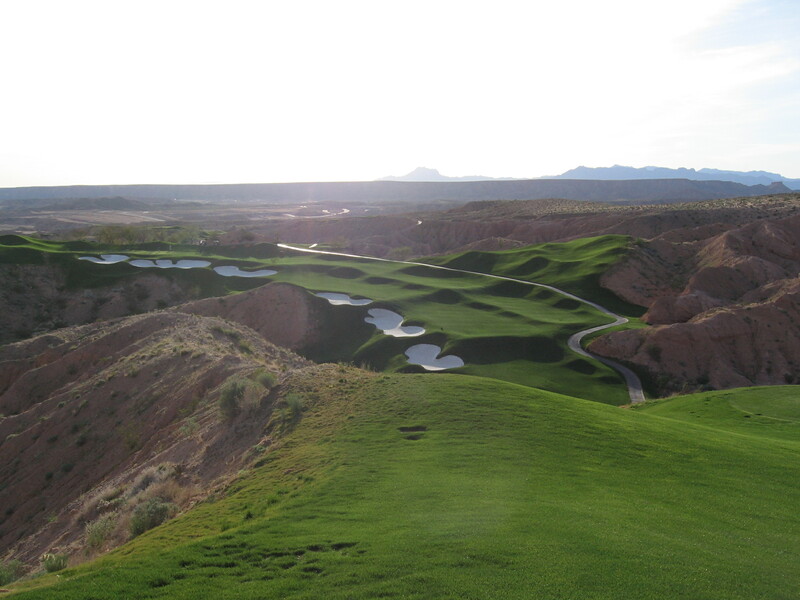 We had a great time and played some great courses, one of which we both reviewed for our first course review of the PF (here https://thepowerfade.wordpress.com/2010/10/06/a-review-of-tpc-las-vegas-aka-the-canyons/ and here https://thepowerfade.wordpress.com/2010/10/06/tpc-las-vegas-part-ii/). 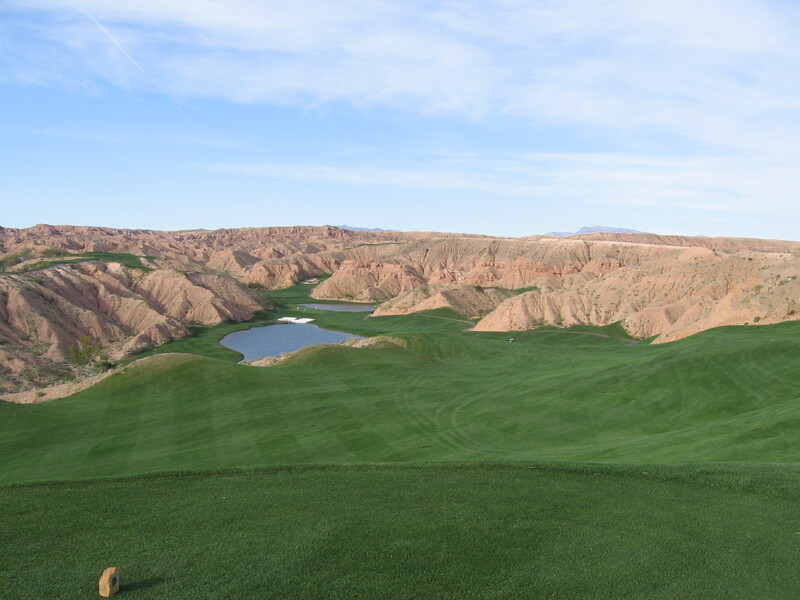 At the same time, we made a trip to Mesquite NV to play what has been hailed since its opening in 2001 as one of America’s 100 top courses: Wolf Creek. At $195/round, LG and I played 36 that day (the rates were a little lower in the afternoon, but April is still the most expensive time of the year to play). We were the first car in the parking lot at 6AM and the last car to leave at 8PM. We stayed overnight at the Virgin River Hotel, Casino, Eatery, Bowling Center, and Ice Cream Parlor (although it’s actually only a hotel/casino, it actually does have all of those things). Am I ever thankful I did that. Wolf Creek is an amazing golf course. It is unlike any other place I’ve played–including some of America’s top 100 and several PGA Tour spots. The course is an amalgamation of what LG and I call “17 signatures holes (and one afterthought hole).” At almost 7,000 yards from the tips, the course actually plays fairly short given the massive elevation changes and the desert air. As a reviewer, the course is just downright fun. There are MANY holes where standing on the tee makes you shiver, if not for the amazing views then for the torture of the shot you’re about to hit. Many balls are hit from elevated tees, where the player must blast the ball 50 to 100 feet down into a canyon below. The course is EXTREMELY challenging off the tee but actually quite easy from the fairway. Many shots into greens were under 160 yards, making for some pretty simple approaches. Although there are dead spots, the course plays pretty fair. And, if you’re not shivering from the views or the challenge, you might actually be shivering from being 100 feet up on a ledge with no guard rail. Some of these places…well…it doesn’t feel right. Both LG and I almost fell into a canyon trying to retrieve a ball he hit. Although the staff tells you not to go into the desert, it’s not that difficult to trek in and find your ball most times. I must say that my favorite hole of all is the one that is ranked #4 most challenging, the par 4 14th. After a few fairly easy holes, the 14th comes with a huge carry over a ravine into a split fairway. The view is tremendous, with a large, freshly-cut green hill as a backdrop for which to aim. The green is fun. The first time we played, LG hit the cart path right of the green, and the ball kept going and going down the hill. LG had a full 8-iron to get back up near the green, but he pulled it off. After the beautiful 14th, the golfer is then treated to one of the shorter drives to the 16th tee. Wait, 16th? Sorry, we forgot the 15th. To us, so did the designer of the course. We described the course as 17 signature holes and one “afterthought” hole because the par-3 16th just feels a little out of place. Even from the back tees, this tiny little par three measures only 125 yards from the tips and plays significantly shorter because it is straight downhill. During our first adventure to Wolf Creek, JK and I came to this hole thinking, wow, I hope 16-18 leave us with something to think about. After JK teed off however, he looked over at me and said “Hey. Just hit it in the hole.” I replied, “Yeah, okay.” “No, seriously. Just hit it in the hole.” At that time, we were playing from the blue tees which left us exactly 116 yards to the flag. I took my PW and hit one of the first shots where I remember thinking “wow, that was pure.” The ball drew slightly as though drawn by the flagstick. It landed about 3 feet passed the flag and rolled back toward the hole. JK and I watched and sank to our knees as it lipped out and rolled to the left of the flag. With that memory in mind, I was looking forward to the 15th more than any other hole during our second trip. This time, I made the mistake of overclubbing and, well, that’s where the story of JK and me almost falling in the canyon came from. My near hole in one on this trip, however, came from the par-3 11th. That’s right folks, I’m about 15 feet away from 7 holes in one if you count them all up. This time, the 11th was playing around 215 yards from the tips (straight downhill). JK hit some absurdly short club like a 7 iron while I was hitting my hack 5 iron. I had the honor from the devilish 10th hole (somehow double won). After putting a good move on this ball, it landed just short of pin high and right of the green. We watched from the tee as it trundled down the sidehill slope and rolled straight toward the pin. We both watched fixated as it slowed near the flag and stopped 2 feet short of the hole. JK was kind enough to concede the bird. Maybe I’ll get that Ace next time, Wolf Creek. All in all, Wolf Creek gives the air of a top-ranked, championship caliber golf course with the finest accommodations. The clubhouse grill is top notch as well, serving great food and great views of the course. Every hole is an opportunity for a computer background photo. At $200/round in peak condition, it’s certainly not cheap, but it is completely worth it for every golfer. Overall: 9/10. Even though there are literally hundreds of courses in and surrounding Las Vegas, I will continue to return to this course on most of my trips there. Please bear with us while we experiment with the layout and exactly how to format our posts. Another one of our goals is to juxtapose not only our personal views of the various items we post about, but also our views in light of our handicaps. As the resident hack (a rather bloated 10.7 to JK’s 0.3 (?) ), my opinion will clearly resonate more with the masses. As mentioned before, this was not our first crack at TPC Las Vegas. I recall two shots in particular from the first trip with particular fondness. Winds reached nearly 35 mph — seriously, we quit after 7 holes because of it. The first was my approach (likely 4th or 5 shot not counting penalties) into par-five 6th. With a stout cross wind, I cut a 5-iron about 135 yards into the green to about 7 feet. Even JK was impressed. The second was the tee shot on the par-three 7th. Playing directly into the now 40 mph wind, JK and I both drew driver (209 for him, 195 for me). After watching two towering draws become two hooks because of the wind, I drew back and nailed what is certainly one of the best drives I have ever hit in my life. Not even a hair off-line, that bridgestone took off straight as a string and cut through the wind. It is somewhat fitting that it would only go 193 yards (that’s golf, right?). It was one of those shots that took felt so good that I could only smile after a ridiculous 4-putt. Anyway, back to the post-bar round. prettiest hole: 18 – Water left makes this a bear too! most difficult hole: 8 – Long and plays into the prevailing wind. This hole calls for a draw off the tee and a very strong second shot uphill into a two-tier green. Be sure to avoid a deep bunker short and one to the left. Going long is not an option as you’ll be using that desert club that JK mentioned. best hole to gamble on: 2 – while it cards in at a stout 196, the true beauty of this downhill par three is that it can play 20 yards above or below that number depending on the wind. Trust your club selection and don’t go left. While I will normally strive to write the narrative of my review from the perspective of a 10-handicapper who works on his game more than he should given his profession, I must confess that shooting a good score was unequivocally the last thing on my mind while playing this round. Having just finished the bar exam and beginning the summer of true freedom that I would have for the foreseeable future, I was dead set on having a good time and enjoying the amazing weather. That attitude notwithstanding, I played several of the holes remarkably well. I’m happy to report that even from the tips, I managed to play the par 3’s at even par. I may have had to venture into the desert on a number of the par 4s and the par-five 4th (a few times), but am happy to report that I finished the round in high spirits and with an even higher score of 89. Part of the charm of this course was that it generally followed the natural lay of the land. A particular feature to note was the large gorge that divided the 14th and 15th holes. For a 10 handicapper, this course presents not only a challenge off the tee (many forced carries and blind tee shots), but also a strong test for your short game. For those aiming to play for score, my personal recommendation for the 10-handicapper who’s Achilles heel is the driver is to play either the blue tees (6769 – 71.0/128) or the men’s blended (68.7/128) and stick to the trusty 3-wood. For those who’s chipping and putting leads to inflated scores, spending a little time on the putting green to get used to the crazy speed on these greens is must. You’re in luck, you get full use of the amazing practice facilities all day when you purchase your tee time. Also, for even the 10-handicapper with an above average short-game, the bunkers on this course tend to be more punitive than most. Avoid at all costs. One more bit of local knowledge: play in the morning. The wind kicks up in the afternoon. Deals/Specials: JK and I managed to get tee times for $199 including a pair of Adidas golf shoes (then valued at $85). We even called ahead and got to order the exact colors and size (issue for those of us wearing 14 or larger) we wanted. Make sure you grab a yardage book for this course from the pro shop. Not only is it immensely useful on the par 5’s and the dog-leg par 4’s, it’s a nice keepsake to remember your round. You can also you use it to write well-informed blog entries (or comments to ours!). 18th Tee. JK on the left, LG on the right. This being the first course review written for this blog, I’m not sure exactly what to write. The caveat to this review: my experience was more than just the course’s describable features. A little background: my co-author (LG) and I met and became friends as interns working together in Palo Alto, CA. Through some random luck, we found out we both liked golf and, through the next few years, learned more and more about each others’ games. 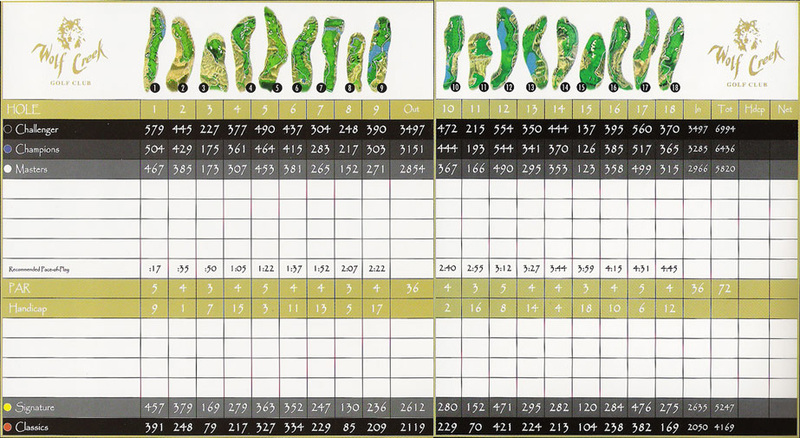 After some time, we started planning trips–a run down to Carmel, CA, to play Spyglass Hill and Spanish Bay, a few trips to Las Vegas to try different courses (including a drive to Mesquite to play Wolf Creek–twice), and a well-planned trip through Alabama on the Robert Trent Jones Golf Trail. 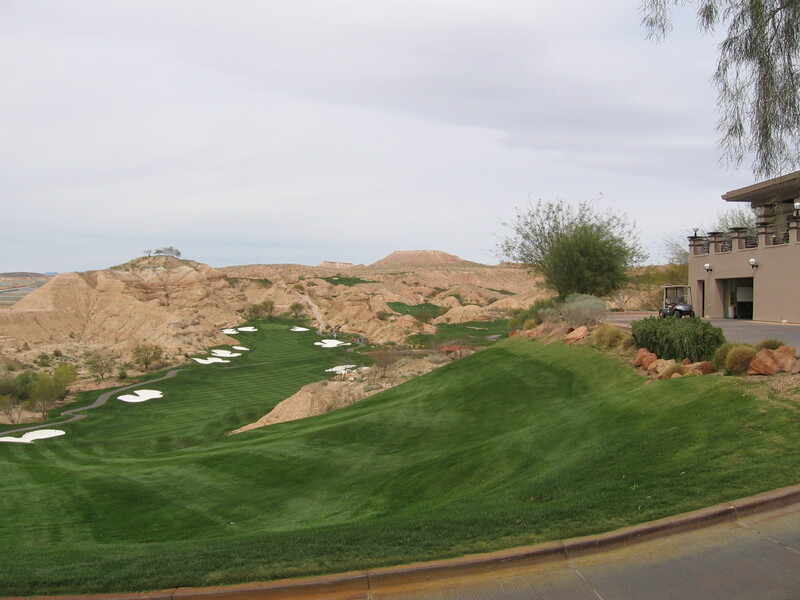 Through our trips, we managed to arrive at TPC Las Vegas twice–first in April 2010. TPC Las Vegas was the third course we had played in 4 days, including two 18-hole rounds at Wolf Creek in Mesquite, NV. Fortunately for my back, we actually had to take a “rain check” due to excessive winds after playing only 9 holes. Determined to make it back and finish the round, we planned a trip for early August 2010. The timing was not coincidental. We had both finished law school and spent the entire summer studying for our respective bar exams (LG in California, JK in Georgia). A quick aside for those that don’t know much about the bar exam: each state decides to thoroughly and painfully torture every person who wants to practice law within the state by administering a test know as “The Bar.” This test is like a random sampling of topics that you may or may not have covered over the prior three years of law school. Your inability to answer the questions on this exam means that you will be unable to work as an attorney–or, in other words, you won’t be permitted to earn a living. Imagine it this way: think back to when you were graduating high school. You didn’t take every single course the school had to offer, but you had the basics–English, History, Math, and most of us were afraid of Sciences. But, at least we had had those subjects. Now, imagine that, before you can graduate high school and move on with life, you have to take a test. One of the questions on the test asks you which US ship was referred to as “Old Ironsides.” The next question asks you which elements make up the halide group. The following question asks you what a driver should do if he sees a flashing yellow light. And the next one asks you to find the limit of f(x) as x goes to infinity of f(x)=1/x. Hopefully, the introduction of mathematical formulas has brought enough fear into this description to fully describe the essence of the Bar. In any case, having taken the Bar, we decided to embark on a journey to Las Vegas to play the course that had gotten away. Did it ever live up to the billing. Measuring at 7050 yards from the back tees, the course seems formidable at first–until you realize that the ball travels a little farther in the desert air. 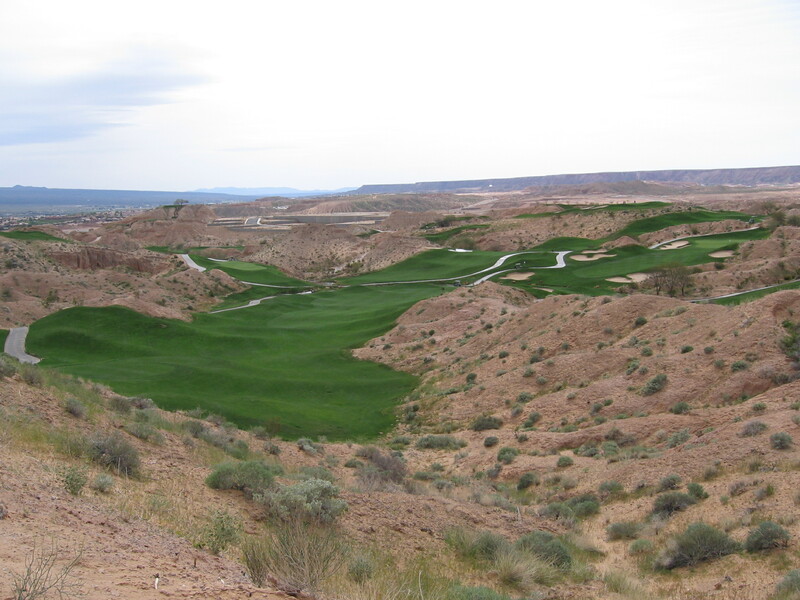 A beautiful patch of green fairway split the rocky desert on each hole. As intimidating as the rocks be, the fairways and greens were even more impressive. When we played in April 2010, the greens were rolling at 13.5 on the stimpmeter (which the starter volunteered). Although they were considerably slower on this occasion (due to the intense summer heat in the desert), they still were smooth and consistent, rolling at least 10.5. One of the most interesting aspects of the course: entering the desert to find and play your golf ball is totally permitted–and even encouraged. Rental sets at the course include a “rock club,” which looked extremely knurled and knicked. Perhaps the highlight of playing the course was the par 3 12th hole. Although only 145 yards, the flight to the green was all carry over a hazard. The hole provided the greatest firework show of the day. Having placed my ball on the green, LG topped his (for a perfect layup short of the hazard), and then laid a gap wedge onto the green. Both of us about 35 feet away, I putted first (because I was borrowing LG’s putter–I didn’t want to bring mine through the airport after having it scratched when traveling earlier). A well-struck putt sailed into the cup as I raised the putter into the air. LG putted next. With the ball only 10 feet off of the face, he harkened back to Family Guy, singing “ball in a cup, ball in a cup, it’s a ball in a cup.” A miraculous birdie and par, and the two of us had made our putts. The course itself just kept getting more incredible. The Canyon holes were amazing. The course finished on an excellent par 4 with a lake just left of the green. All-in-all, the course was amazing, and the perfect end to a stressful week. Although I probably wouldn’t play the course again–there are just so many others to choose from–I would definitely recommend this spot to anyone.